Michael McFadyen's Scuba Diving - The Wall (Apartments) What a dive!!! I have dived in more than nine countries of the Pacific Ocean, dived coral reefs and the world's best wrecks, but on 24 June 1995 I had a dive that rivalled the best offered anywhere in the Pacific. What made this even more amazing was the fact that I could see the centre of Sydney from the dive location. I dived this site a number of times now and all have been excellent. 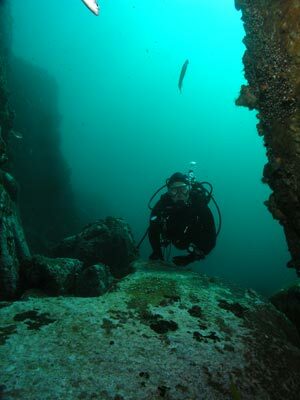 This site is located north of Sydney Harbour just off Long Reef. The site is known as The Wall or The Apartments. The first name is obvious, but the second not so. I am not sure if it comes from the block of apartments on the shore or the fact that under the boulders there are hundreds of "apartments" created by boulders. This location is 33° 44'17.4"S 151° 19' 38.4"E (using AUS66). This came from some divers and I think may have been based on Tom Byron's readings. It is said to be accurate. Note that all the GPS Readings on my Web Site are taken using AUS66 as the map datum. If you use another datum you may be about 220 metres off the wreck. See my GPS Page for more details and how to convert readings. 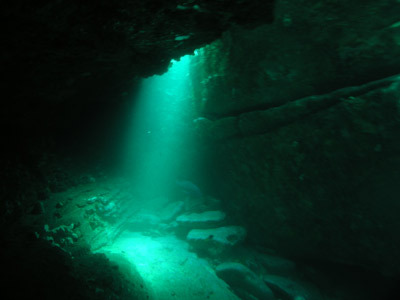 Once you arrive at this location, run east or west (depending on the wind) and you will see that the depth comes up from 20 plus metres on the east side to about 8 to 10 metres. Anchor in about 10 metres if you can. This site consists of a ridge that runs roughly north-south. As mentioned, it is about 8 metres on the top. In fact, although I have not examined this site in great detail, I think that there might be a couple of ridges running parallel. 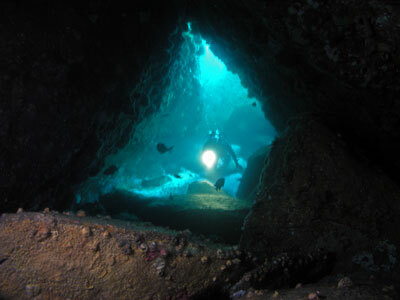 I have not dived to the west of the ridge but to the east, the reef slopes down in a series of drops to about 15 metres and then there are a series of large boulders. Visibility here is normally pretty good and you can usually see the reef from the surface. Once you hit the bottom, drop to the bottom of the main wall and swim along the edge. On a couple of dives here within a few metres of the anchor we saw four or five huge cuttlefish. There were a lot of fish around, red morwong, bream, leatherjacket, silver sweep, yellowtail, sea pike and sergeant baker to name a few species. To the east from the anchor spot should be a couple of very large boulders or rocks. If you come to a very large rock with an overhang, head south and around the back of it. This forms a sort of alleyway that leads towards what appears to be a cave. Each time I have dived here (and there have been at least seven years in between each dive), when I approached this location I have sensed I had been here before. After a few more metres I realised I have dived this area the last time I was here. Yes, here was the first of two objectives on this dive, The Cathedral. This has been formed by two enormous sandstone blocks resting against each other in the shape of a church's roof. 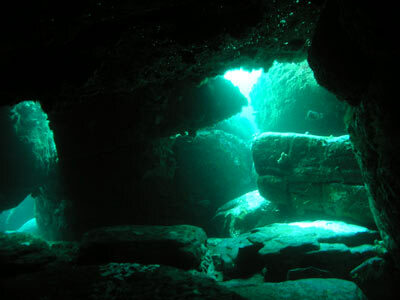 Entering from the southern side, you swim through the cavity towards the "altar". There are usually a large number of fish in the entrances of The Cathedral, probably ladder-finned pomfret. It is really easy to see how The Cathedral got its name when you are looking towards the north. You exit out the "stain glass window". On every dive here, the fishlife in this area has been simply prolific, with thousands and thousands of pomfret all over the place. On one dive here, something caught my eye. A huge dark, moving shape was beyond the rock. No, its was not a whale like divers on our boat had seen the day before anchored on the SS Undola. Getting closer, I saw that the shape was in fact composed of millions of fish (well tens of thousands at least). Yellow-finned pomfret, yellowtail, silver sweep and assorted fish of other species hovered over the gullies between a couple of the larger boulders. This was an amazing site. Swimming in and under the fish it got very dark, even though it was a bright and sunny day above water. It was almost like a night dive, torches an essential requirement to see. I had never seen so many fish, not even on the normally covered wrecks of the SS Tuggerah and SS Undola on Sydney's southern outskirts. Certainly more fish than I have ever seen on coral reefs and these fish were bigger than the fish I had normally seen in large schools on coral reefs. 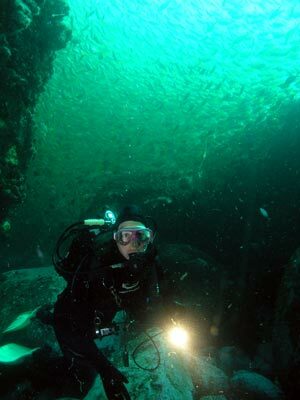 Even on my most recent dive here in September 2007, you could not see through the fish. From here, swim around the boulders in a anti-clockwise circle and eventually you will end up back at the main wall. Follow this wall to the south and explore the numerous holes created by the large boulders. You may see more cuttlefish here. You will be generally following The Wall to the south (depth about 15 m), straying off the vertical drop here and there but mostly examining the overhangs and small caves. The other exciting thing to see at this location is a very large complex cave system called Andys Cave. It can be hard to find. Alas, on a couple of dives I could not find it at first. Eventually you should find it. 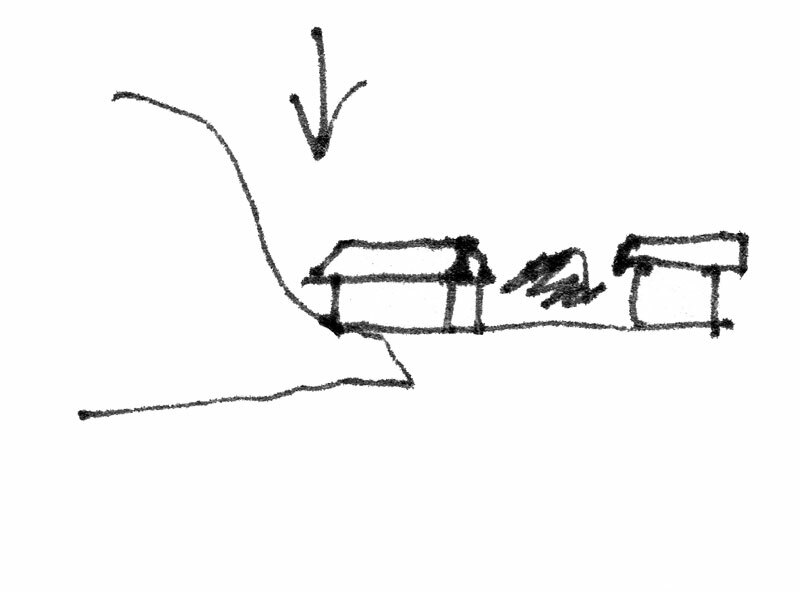 The entrance to the cave is at about 15 metres and is formed by a large rock lying at 60°. 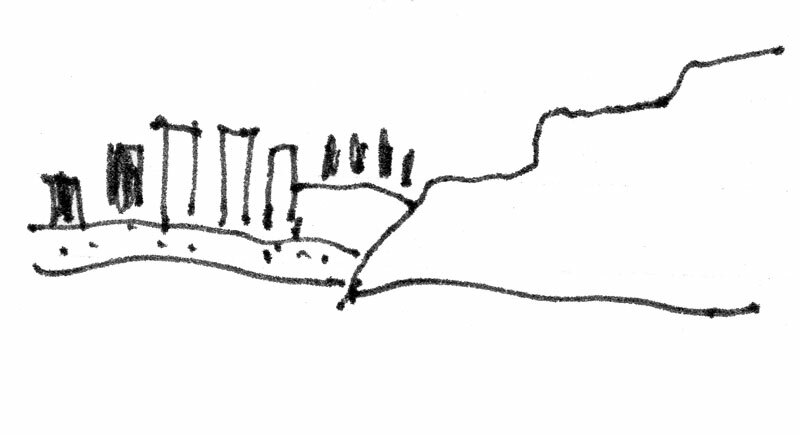 You enter the space under the rock and then turn right to swim through a low, large cave, along a short passage into a longish cave with which has small and large "skylight" exits above. The third last time I was here there were 15 cuttlefish alone in this cave, but on more recent dives I saw none. You exit out the top. On some dives here, even though I had been down for quite some time and the cool water, the dive was too interesting to let us feel cold. Most times I heave headed back to The Cathedral to worship yet again. The fish will still be there. We swim in and out, watching them swirl around our exhaust bubbles. Looking back now as I update this (and having re-read my earlier report on this dive site in the November 1993 DIVE Log), I am still in awe of how good this dive site is. I remember my first dive here and it too was great. 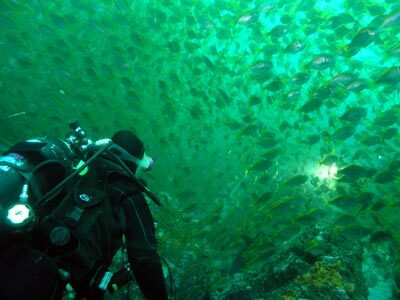 Whatever you do, make sure that this winter you dive The Wall at Long Reef.